Greenspan’s tenure began 2 months before the Stock Market Crash of October, 1987 and ended just before the Sub-prime Mortgage Meltdown of 2007, which was followed by the Market Collapses of 2008 and Recession of 2009. The highly misguided policies of Alan Greenspan set up the FED to become a money printing press thus plunging the US dollar into a downward spiral of devaluation and buying power. More than any other individual in U.S. history, Federal Reserve Chairman Alan Greenspan is responsible for systematically wrecking the American Republic. In fact, the real damage from his monetary manipulation and financial destruction is yet to be seen. N.B. Now here’s a David Stockman reality check that touches on this serious matter. 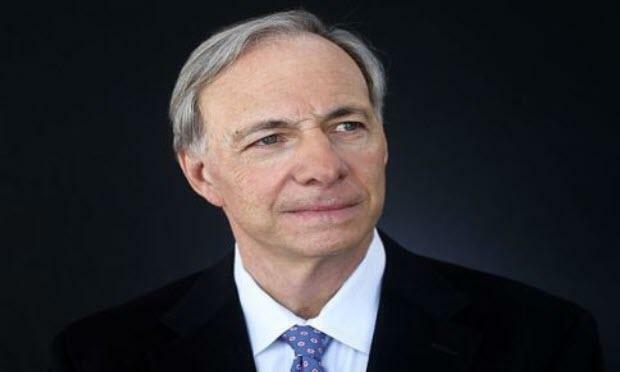 We are referring to Ray Dalio’s punking of the very capitalism under which his $160 billion hedge funds has become the largest in the world and his net worth has soared to a tidy $18 billion. Yet Sunday night he told millions of “60 Minutes” viewers that the American Dream is dead, capitalism is in desperate need of reform and that wealth, income and opportunity maldistribution in the US is so severe that the President should call an national emergency. 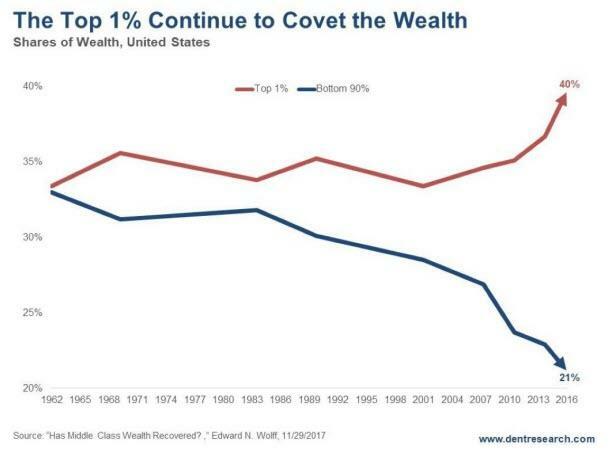 Therefore, if the top 1% went from a 34% share of the national wealth to 40% during the last three decades while the bottom 90% went from a roughly equivalent share (33%) down to just half of the slice (21%) going to the super wealthy, it should at least be conceded that the essence of capitalism did not change during that interval. Nor did Ronald Reagan’s so-called trickle down tax cut policy skew even more to the rich. In fact, the low water mark on the top marginal tax rate was the 28% level embedded in the 1986 tax reform act, which rose steadily thereafter to an effective rate of 42% by December 2017. Still, the best that Dalio could muster while studiously avoiding the central banking elephant in the room was that people are being left behind by technology. That is, the same explanation the Luddites had when they were smashing the mechanically powered textile looms back in the 18th century. Then again, the hoary story about technology displacing good jobs is supposed to embody a kind of economic neutron bomb. That is, the jobs are wiped out but production is left standing and keeps growing. Alas, that has not happened. 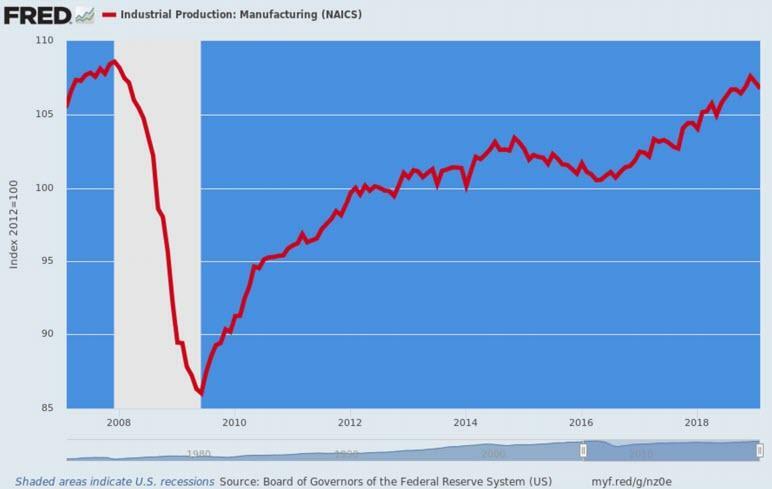 The physical volume of manufacturing output in February 2019 was no higher than it was in March 2007! That’s a 12-year round trip to square #1—and it’s the primary reason that high paying manufacturing jobs have disappeared, not robots and automation, which have been with us for decades. For want of doubt, here are the five previous business cycles since the early 1970s, and in each case output that was temporarily lost during the recession was quickly recouped, with the index rising steadily higher with each recovery. Overall, the physical index of manufacturing output rose at a rate of 3.0% per annum over the 35 year period. Needless to say, when the trend rate of output growth abruptly downshifts from 3.0% annual growth to 0.0% on an across the cycle basis, something is going on, but it’s not robots replacing workers. Nor was it an outbreak of asceticism among American households. 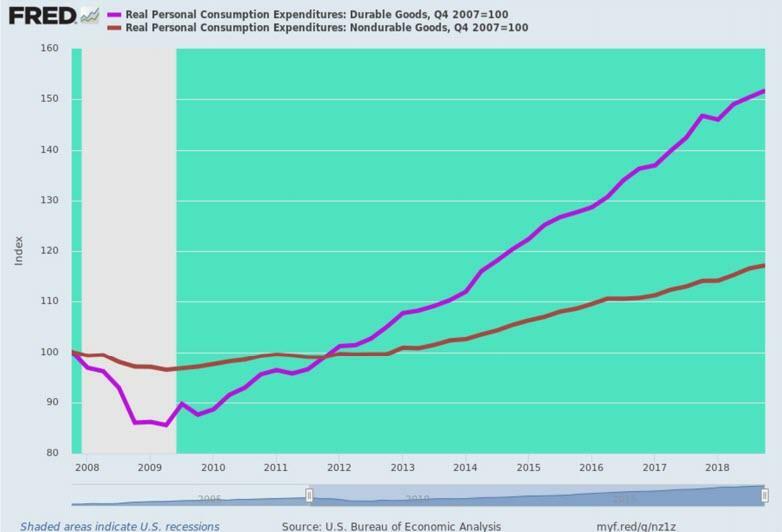 During the same 12 years during which domestic manufacturing output grew by 0.0%, real household consumption of non-durable goods rose by 17% and durable goods by 52%. There is only one way to explain the asymmetrical math. Self-evidently, the US economy on the margin has imported essentially 100% of growth in goods consumption since the pre-crisis peak. What comes to mind, therefore, is off-shoring and bad money. That is, the Fed kept the lower 60% of households that Dalio is worried about treading water with cheap mortgage debt, underwater car loans, unrepayable student debt and a tail-chasing rise of higher cost credit card finance. Needless to say, artificial debt-fueled support of living standards doesn’t make for prosperity or the lost American Dream that Dalio rightly laments. 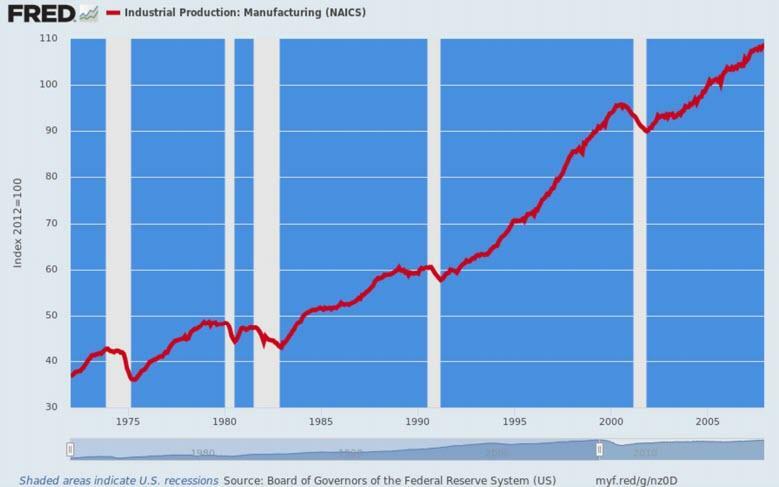 In fact, the main street economy has been so badly pummeled by the Keynesian money printers in the Eccles Building that hardly any breadwinner jobs have been created during the entirety of the 21st century to date. That’s right. Since the days when Bill Clinton was packing his bags to shuffle out of the White House, the total number of breadwinner jobs is up by just 3%. That’s hardly 9,700 jobs per month in an environment were the working age population has been growing by about 200,000 per month. Again, do we think that since January 2001, capitalism has lost its mojo and needs to be “reformed” by the geniuses in Washington per Dalio’s recommendation? Or that in the alternative, technological progress has gotten so red-hot that its eating the middle class alive? We do not. The only thing that has really changed in the last few decades is the central banks. They have been taken over by Keynesian economy-wreckers. So the elephant in the room lumbers in plain sight. The central banks of the world have purchased $21 trillion of government debt and related securities since 2003, thereby putting their Big Fat Thumb on the supply and demand scale like never before even imagined by the most far out Keynesian economists. So doing, they made the carry cost of debt dirt cheap relative to risk, inflation and the time value of money. Not surprisingly, therefore, the world economy went head-overheels lapping it up. Thus, at the pre-crisis peak in 2007, global GDP was about $58 trillion and total debt outstanding was about $100 trillion–implying a leverage ratio of 1.7X. By contrast, a decade latter global debt outstanding had soared to $250 trillion against a planet-wide nominal GDP which had risen to just $80 trillion. That amounted to a 3.1X leverage ratio and the implications hardly need elaboration. 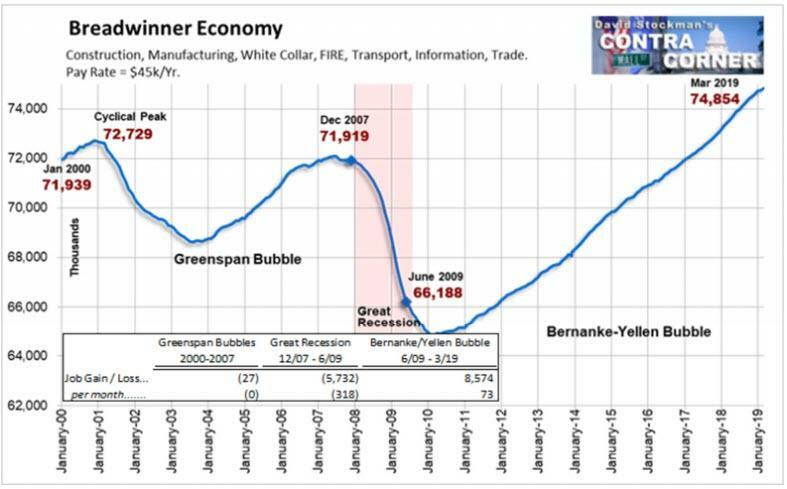 We are not aware of any sane or even quasi-sane economist who argued in 2007 that the world economy was suffering from too little debt; and, in fact, the universal hue and cry for years after the global economy almost lost its lunch during 2008-2009 was that there was way too much debt. That is, salvation would come through deleveraging—or at least no more of the galloping gains which had occurred during the prior two decades. That was then, but this is now—with 1.4 more turns of leverage on the world economy than stood on the eve of the financial crisis. So at current GDP levels, that’s an extra $112 trillion of debt! We are hard-pressed to think of what would constitute a larger elephant in the room than $112 trillion of incremental debt. Nor do we doubt that an 11-year growth rate of debt at 8.3% per annum versus annual GDP growth of 3.0% adds up to sustainable prosperity. Moreover, it’s also not that hard to see why the central banks can not escape paternity for this giant deformation. 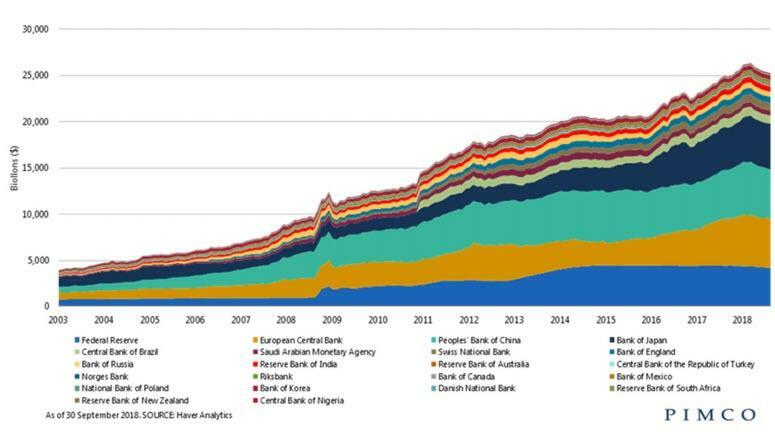 After all, at the beginning of the chart below (2003), the combined central bank balance sheet was about $4 trillion, representing 10% of world GDP of $39 trillion. By contrast, today, the $25 trillion of central bank footings amount to more than 31% of global GDP. What we are saying is that the eruption of worldwide debt during the last 11 years was not accompanied by an outbreak of frugality and propensity to save on the part of households, governments and businesses. Instead, it was financed from $21 trillion of “something for nothing”, which was injected into the global financial system by the central banks. So by the year 2019, the whole Bubble Finance scheme has gone from the sublime to the ridiculous. In the case of the BOJ, which is only the advance guard of the Keynesian money-printers who run all the main central banks, its footings now exceed 100% of Japan’s GDP, it owns 90% of all Japanese ETF assets outstanding and 43% of Japan’s gargantuan public debt. 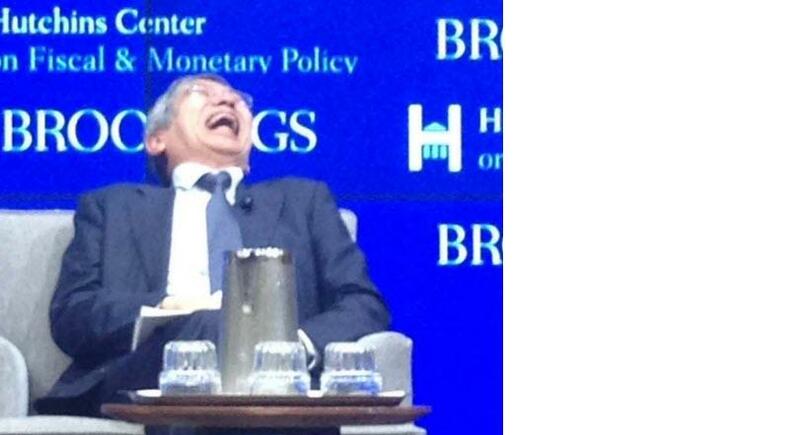 Yet the madman who runs the BOJ, Haruhiko Kuroda, insists that he will keep printing until Japan is blessed with the alleged elixir of 2.00% inflation. In all, since 1999 the bank of Japan’s balance sheet has risen by 604% compared to a mere 5% gain in the yen value of Japan’s nominal GDP. It is literally hard to imagine a more hideous insult to sound finance than that—yet Japan’s central banking abomination is treated as just part of the landscape in today’s bubble-infested financial system. Nor is Japan a single case aberration or even outlier. Here is the same picture for the ECB and the eurozone GDP. That is, since 1999 the ECB’s balance sheet is up by 575% compared to a 77% gain in nominal GDP. Nor is the US situation any different. Since 1999, the Fed’s balance sheet has grown by 1000%, while nominal GDP is up by just 110%. 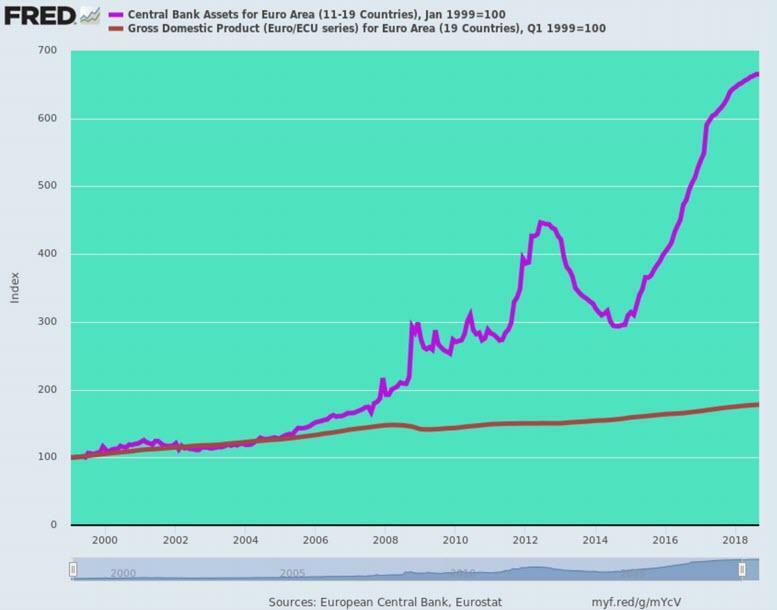 Needless to say, this massive expansion of central bank balance sheets has caused the world to be inundated with debt and speculation, and to become shorn of the historical mechanisms of honest price discovery and discipline in financial asset markets. So, to return to the Ray Dalio contretemps of the day, there is a reason why the top 1% is wallowing in unspeakable paper wealth, while the bottom 90% of households tread water at best on a year-to-year basis; and have built up no cushion for retirement or rainy day needs at all. To wit, it’s due to the scourge of Keynesian central banking that, ironically, is the one and same mechanism that has enabled Bridgewater’s risk party trades to flourish and Ray Dalio to become so rich that he is now on bubblevision begging to be taxed. We have a better answer, of course. Abolish the FOMC and capitalism will not be in need of “reform”. And more than likely, Ray Dalio won’t find advocacy of high taxes to be such a niftyform of virtue signaling, either.